Science fiction authors are expected to have a crystal ball. Not with the precision focus of a fortune teller’s, thank goodness, but able to see the broad strokes of the future, mainly from observing social and technological trends. Because, we humans now have the power to shape our bodies, our minds, even our planet, for good or bad. We’re building our future world. Personally, I’d like a Star Trek future (the optimistic Gene Roddenberry vision) as opposed to, say, a Neuromancerfuture, or a Blade Runner future, or a MaddAddam future. But if we don’t truly understand what we want, how will we know what to build? This blog is as good a place as any to look at the future we want and the things we’ll have to do to make it. So I’ll be doing that in coming weeks. Just don’t hold me to any predictions. And don’t ask me for a personal reading. It doesn’t take a crystal ball to know that one of the most critical needs for our future is clean energy. Coal and oil burning pollute the air and do scary things to the climate. Nuclear fission produces waste that’s radioactive for thousands of years, and its accidents could give us all cancer. Solar and wind energy sources are becoming more efficient, but may never meet all of our needs. 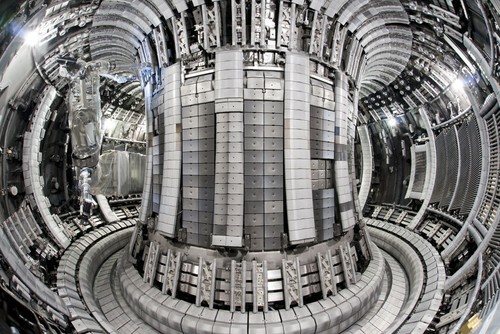 So the best bet looks to be (drum roll please)…nuclear fusion. Wow, I just broke some news that’s been around for a hundred years. OK, so just because it isn’t new doesn’t mean it isn’t true. Nuclear fusion reactors use fuel that’s in great abundance (usually hydrogen isotopes made using seawater and lithium), produce waste that loses its radioactivity within a few hundred years, not thousands, require few safety measures because the reaction can’t sustain itself, won’t poison the environment with long-lived radio-isotopes in the event of a leak, and produce a lot of energy. Fantastic, right? Unfortunately the pin that bursts the nuclear fusion bubble is that so far we haven’t been able to produce a sustained fusion reaction that doesn’t use as much energy to keep it going as the amount of energy it produces. Not such a profitable equation. However, many scientists believe the problem is just a question of scale: build a reactor big enough and the thing will work without needing large amounts of energy to keep the flame lit. Based on that theory, a huge facility in Cadarache, France called the ITER Project is being built by a partnership of the European Union (as hosts), the U.S., China, Russia, Japan, India, and South Korea. It is a mega-project, after all. Mega as in: an original budget of about 5 billion euros but now projected to reach 16 billion. And that’s just for an experimental reactor that isn’t intended to generate electricity, but simply prove that the concept is viable! If you get heart palpitations thinking about all of the other worthwhile things 16 billion euros could pay for, remember that if fusion can be made to work on a commercial scale, it could solve nearly every problem related to energy production that we face today, and then, thanks to cheap and abundant energy, go on to solve many other problems (running plants to turn seawater into fresh water, for example). Fusion energy is the future we want. So the monetary investment is what we need to do to get it. That’s the way this future-building thing works.